No, not the Go tell the Spartans, stranger passing by, That here, obedient to Spartan law, we lie, 300. I have not posted for a while, both because I have some pending projects that I wanted to finish and be cause of regular life taking up more time; but also, and possibly more importantly because I wanted to do something for the 300th post to the blog. So yeah, 300 posts. Pretty amazing if you think about it, particularly if you consider that my lovely and supportive wife and I bought a house and had two kids during that time; and over 46,000 page views and 60 followers is also quite gratifying. So yay, me, and here is a bit of blog celebration and some highlights. Armies of the Napoleonic Wars: An Illustrated History A new post and popular for reasons unknown to me. Seems to be popular in Spain. Swords Popular as a Google search, possibly because there are not many pictures of "short swords" out there. Post Possibly popular because of the sprue picture, popular with me because it features the Games Workshop brochure that Tony kindly sent me. Kampfgruppe Normandy Was popular at the time of its posting because there was lots of interest in the book... most of which is no doubt gone now that it is OOP. Giant: the largest kit I have painted (since the Baneblade is still unpainted!). I think I could do a better job now, but it still quite imposing. Scratch built galley: Turning scrap wood and paper into a scale model was extremely satisfying, and I think that the result is quite nice as well, considering. Deepest Sea Players' Guide: by far my most ambitious project, with 28 pages of content covering the various things that a player in my little universe needs to know, both about the setting, and D&D play generally. Inq28: Poised to explode onto this blog, now that I have over 20 figures near to the "complete" phase and ready for paint. This has been underway for years, so it will warm the cockles of my heart to get the blighters painted and on the 'net for everyone to see. Inquisitor d1000: Seven segments deep now, and only a few more to go. I will make up a new page to the blog when it is done for ready access. Dwarf Sculpting: Decided to DIY my Longbeard regiment... one miniature at a time. Thank you, dear readers for helping me along the way, and for continuing to read that which I pour out. Scanned from next week's White Dwarf, not by me. 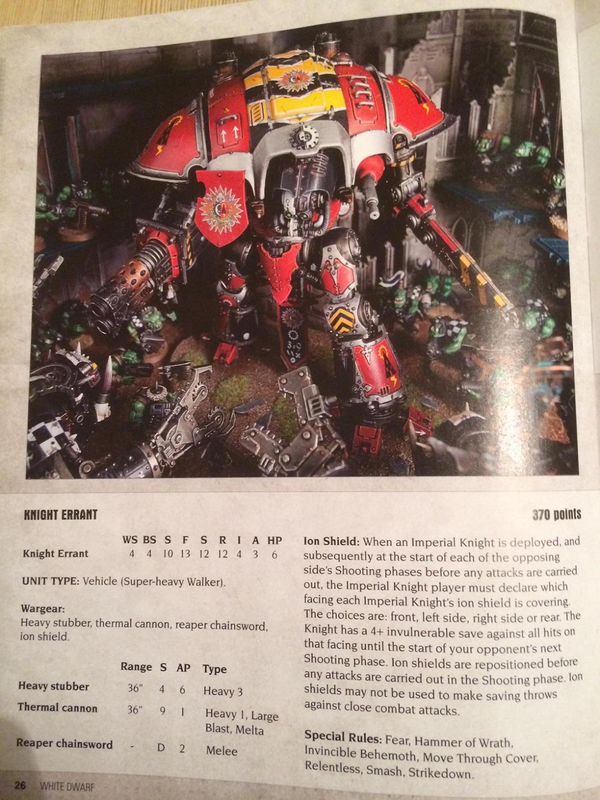 This is an Imperial Knight Errant, which is apparently coming out in a couple of weeks from GW. Knights Errant and Knights in general were part of the Epic game, but obviously were too large for Warhammer 40k back in the day... and now they are being released in glorious plastic. I said previously that a DakkaJet would be my next big kit (was it really nearly two years ago? ), but one of these guys, with banners flying and on a modeled display base is going to have to be it instead. Wow. 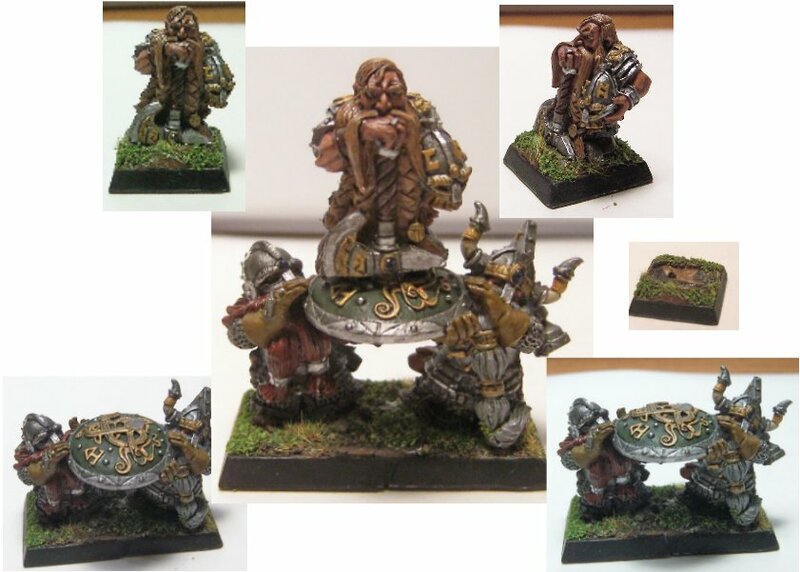 Long ago I painted up a regiment of dwarfs for use as a Dogs of War regiment in my Empire army. Correspondingly, they had some puff and slash arms, and a few other "Empire" features. I decided that I liked dwarfs enough to get more, and as was my habit at the time, bought some (many). With the latest release from Games Workshop being the Dwarfs, I felt inspired, and had a rummage through my various boxes and bit bins and discovered that I have well over 2000 points worth of Dwarfs unbuilt, and of course unpainted. These are mostly 5th edition metal and 6th edition plastics, with a few newer pieces courtesy of the 7th edition starter box, Battle at Skull Pass. Really, All I lack are rare pieces, such as a flame cannon or a gyrocopter, but neither of those are particularly expensive if I wanted to add them. 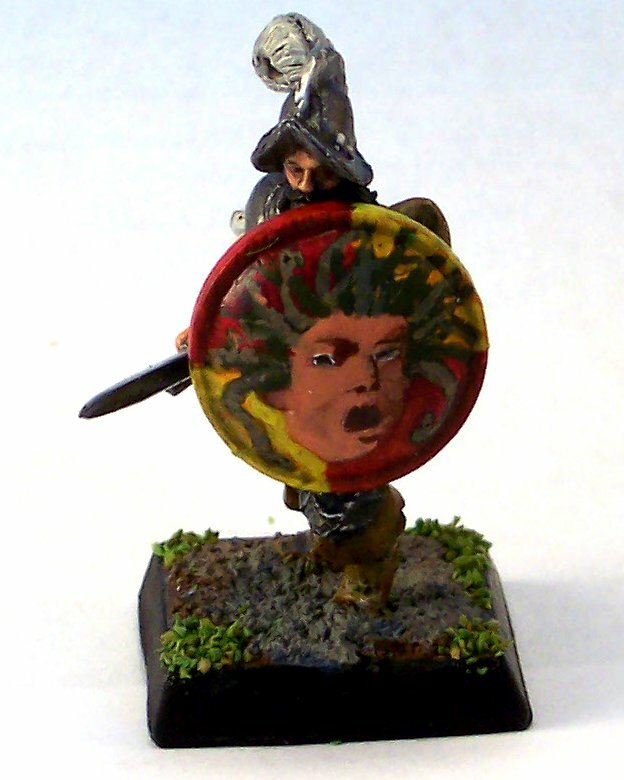 I do not have any pictures of my first regiment at hand, but I do have pictures of my converted lord carried on a shield, which I built in 2008, and in a rare move for me, painted very quickly. Magnetized so he can walk as well. Hopefully my next dwarfs will be painted sooner than 6 years from now! 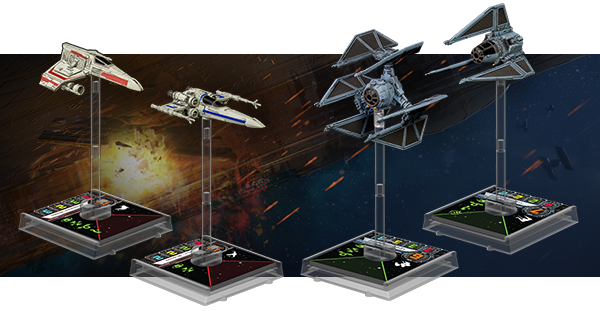 Fantasy Flight has just announced their next wave of expansions for the X-wing game, which will include my favorite, the Z-95, as well as fan favorite TIE Defender. The E-wing is 3/3/2/3 can take droid and system upgrades, which with elite pilot skills will make for a huge combinations of potential abilities. The TIE phantom is 4/2/2/2 but has a cloaking system.. not sure how that is going to work. Pretty excited about this release.. still need to play the darn game though! Anyway, as always, let me know what you think. As I mentioned last year, Lead Painter League is a contest put on by the excellent Lead Adventure forum. Here are the rules for this year. Changes are that photography is further limited, and that the bonus themes are just one team, rather than having one or more of them with two opposing teams. And the bonus themes this time around are "Fantasy", "Ancient World", and "Great War", the last of which is obviously quite topical. Even if you do not particpate (although you should!) it is certainly worth browsing the contest entries as they are in the main, quite excellent. The competition starts March 22nd, and there are only 50 spaces available, so get painting. This weekend I made it into the local game store to get the new weekly White Dwarf, the new monthly Warhammer Visions, and also to scope out all the newest and greatest things. I was partly successful, in that they did not have any copies of Warhammer Visions, but I did manage to get the weekly White Dwarf, as well as the previous two months' magazines. I also noticed that Flames of War is down to about 3 feet of space in the very large store, and Bolt Action has taken all of its wall space. X-wing was down to a couple of starter boxes and some TIE fighters, where as Star Trek Fleet Action took up all of its former space. The store was pretty quiet, but there were some older guys playing Battletech (with unpainted miniatures of course). 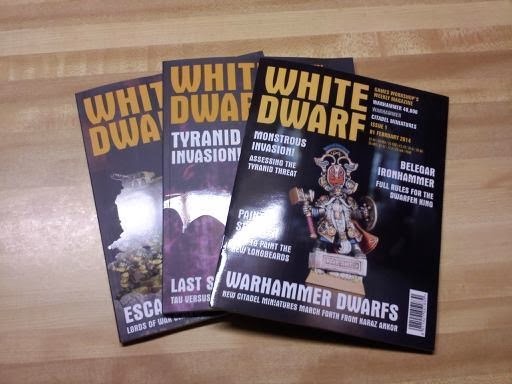 In regards to the weekly White Dwarf, it seems like a nice enough little magazine to me, and with a few tweaks I would be happy to subscribe to it. However, there is currently no subscription option for the White Dwarf (just the Warhammer Visions), and having to go down to the shop weekly and spend $208 a year is a bit more than I can stomach. So, in the absence of some sort of money saving subscription, I think that I will have to restrict myself to buying only the magazines associated with the games/armies I have, which will be difficult, as they are not announced in advance. I have only had the chance to flip through the new magazine, so all I can say is that I liked the articles and material that were retained as compared to what was cut (no more store listings!). I will also say that I was surprised that a more "disposable" version of the magazine has an even higher print quality, as the cover and pages are quite thick and durable. Indeed, it compares to the quality of a Warhammer 40k 3rd edition Codex, but full color.